I confess to having alot of fun painting my friends 90's era Eldar. 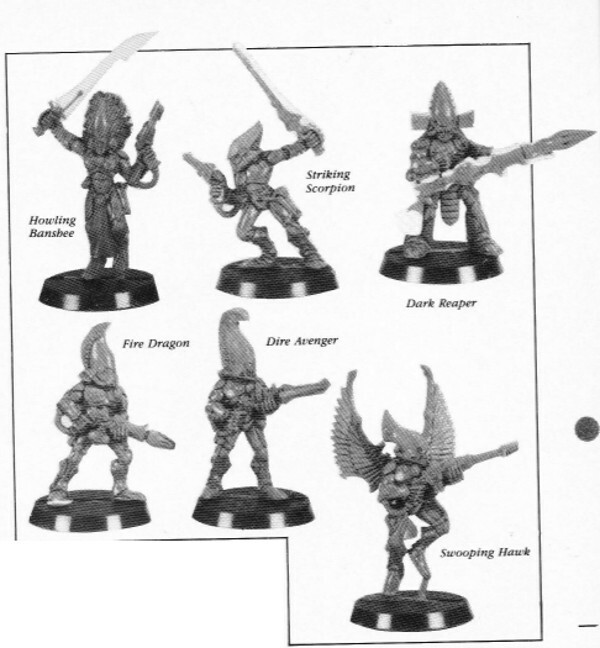 Here is the second squad of aspect warriors I've done - Dire Avengers. I was re-reading (a borrowed) White Dwarf 125 (dated May 1990) this weekend which has the first pictures of the Eldar aspect warriors. These sculpts obviously made it into the final production and still look fantastic. 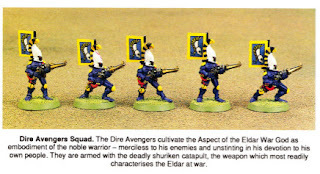 And then in White Dwarf 138 Mike McVey gives an overview on how to paint Andy Chambers' new Eldar force ("we decided to make the army a force from one of the less well-known Craftworlds, Alaitoc Craftworld."). I am now seriously contemplating trying to make back banners for the Eldar. WD138 includes a template for the dire avenger banner, and the banner pole is a pin fitted into a narrow hole drilled into the back. Here's the Exach pointing by himself. And Dire Avengers 1 & 2. And Dire Avengers 3 & 4. I am debating redoing the gemstones in the bases as purple/pink to tie in with the Striking Scorpions, as the blue ones get lost with all the blue going on. I'll think about that. Disclaimer: This web site is completely unofficial and in no way endorsed by Games Workshop Limited. White Dwarf, the White Dwarf logo, and all associated Illustrations and images from the Warhammer 40,000 universe are either ®, TM and/or © Copyright Games Workshop Ltd 2000-2011, variably registered in the UK and other countries around the world. Used without permission. No challenge to their status intended. All Rights Reserved to their respective owners.